The Select Committee On Sea Level Rise And The California Economy is examining how rising water along the state’s famous coastline will affect fishing, tourism and agriculture. Brown told graduating U.C. Berkeley students recently that higher ocean waters will present the greatest environmental challenge yet. He said then that climate change and melting ice caps pose a much more serious threat to the future than any other issue. You already posted this nonsense once. Grow up. My memory isn’t as good as it used to be, but didn’t Chicken Little start the PC environmental hysteria by crying out “the ocean is rising, the ocean is rising”? Rubbish, and I know. I check the tidal benchmarks in the NOAA PID files regularly. You lie Jerry. Bad Jesuit. have you seen the lake at the north pole? 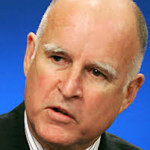 It is about time Governor Brown addressed this issue. The changes humans will have to make to deal with the rising ocean levels are going to be costly and take much time to accomplish. I have been grinding my teeth over Brown’s wasting his time (and our funds) on his bullet train to no-where, while the future of our state, and our country, depends on starting NOW to deal with this predictable threat to our future. The Arabs have lots of sand just waiting for the beaches to come. Think positive and look forward to belly dancers and fun in the sun. So, why, Governor Brown do you and yours make it impossible to set up desal plants along the California coast. The coastal commission is protecting the coastline that you say will be gone in time. Maybe you should talk to California water officials instead of students at UCBerkeley. Just a suggestion. It is not impossible to build desalination plants along the California coast. Because of the potential damage to the environment, there are specific guidelines that have to be met. However, given the possibility of coastal flooding, perhaps consideration of building any type of development along the coast should be suspended until new policies can be set. In Australia, there are areas along the coast where people can no longer buy or sell property, nor can they get building permits for existing residential lots. Australia enacted these laws because of the anticipated coastal flooding due to climate change. This junk science to get funding is becoming ridiculous. The climate changes, it always has: get over it. The climate change Gov. Brown is going to address is NOT the usual climate change we have experienced in the past. Not only is the change much more extreme, it is occurring at an accelerated rate. My bad. Hard to keep up with all the changes in the lie. Thankfully, there are enough professional charlatans and liars about.